Garofalo Gluten Free Penne with Rapini and Sausage Recipe - Martelli Foods Inc.
Place sausage in a large skillet over medium-high heat. Cook, stirring until browned, 5 to 8 minutes. Add oil, garlic, and red pepper flakes. Cook, stirring about 30 seconds. Set aside for Step 4. Bring 4 litres of water to a boil in a large pot. Add salt, return to a boil and add pasta. Cooke according to package instructions. After 2 minutes add rapini to the pasta water as well. Cook all together until pasta is al dente. Reserve 2 ladles of pasta water and then drain. Place reserved skillet over medium-high heat. 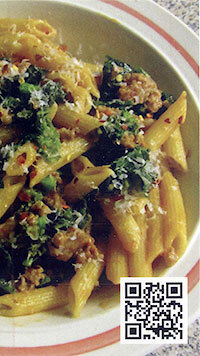 Using a large slotted spoon, add cooked pasta and rapini into the pan. Add one ladle of reserved cooking liquid (or more if it seems dry) and stir to combine; sprinkle with cheese and serve immediately.